This gene encodes a member of the WNT1 inducible sigling pathway (WISP) protein subfamily, which belongs to the connective tissue growth factor (CTGF) family. WNT1 is a member of a family of cysteine-rich, glycosylated sigling proteins that mediate diverse developmental processes. The CTGF family members are characterized by four conserved cysteine-rich domains: insulin-like growth factor-binding domain, von Willebrand factor type C module, thrombospondin domain and C-termil cystine knot-like (CT) domain. The encoded protein lacks the CT domain which is implicated in dimerization and heparin binding. It is 72% identical to the mouse protein at the amino acid level. This gene may be downstream in the WNT1 sigling pathway that is relevant to malignt transformation. Its expression in colon tumors is reduced while the other two WISP members are overexpressed in colon tumors. It is expressed at high levels in bone tissue, and may play an important role in modulating bone turnover. 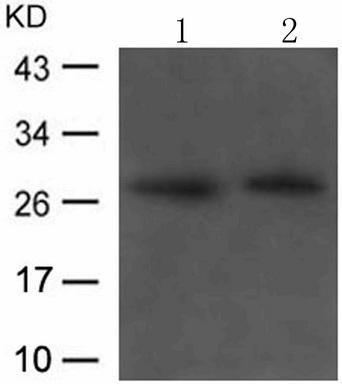 Western blot analysis of WISP2 polyclonal antibody ( Cat # PAB4836 ) in A-549 cell lysate. 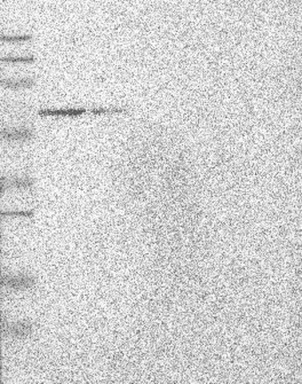 WISP2 ( arrow ) was detected using purified polyclonal antibody. Secondary HRP-anti-rabbit was used for signal visualization with chemiluminescence. Western Blot analysis of WISP2 expression in transfected 293T cell line (H00008839-T01) by WISP2 MaxPab polyclonal antibody.Lane 1: WISP2 transfected lysate(27.5 KDa).Lane 2: Non-transfected lysate. Western blot analysis of anti-Wisp2 Ctr Pab in A549 cell lysate. Wisp2 (arrow) was detected using purified Pab. Secondary HRP-anti-rabbit was used for signal visualization with chemiluminescence. 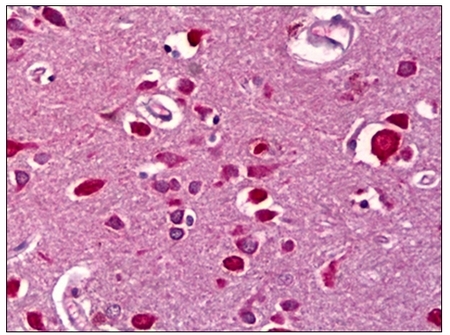 Formalin-Fixed, Paraffin-Embedded Human Brain, Cortex stained with WISP2 Antibody Cat.-No AM31932PU-N (Clone 1E11) at 5 µg/ml after heat-induced antigen retrieval. Western Blot analysis of WISP2 expression in transfected 293T cell line by WISP2 monoclonal antibody, clone 1E11. 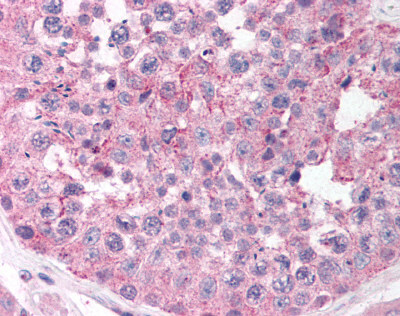 Immunohistochemical staining of human salivary gland shows strong positivity in glandular cells.This validation was performed by Protein Atlas and the presentation of data is for informational purposes only. 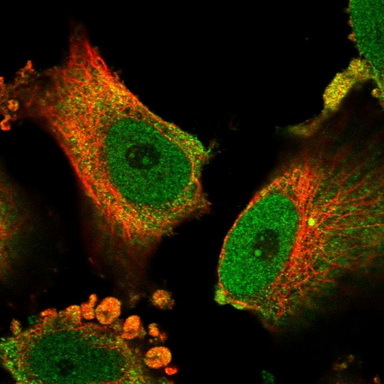 Immunofluorescent staining of human cell line U-251 MG shows positivity in nucleoli, nucleus but not nucleoli & cytoplasm.This validation was performed by Protein Atlas and the presentation of data is for informational purposes only. Lane 1: Marker [kDa] 250, 130, 95, 72, 55, 36, 28, 17, 11; Lane 2: RT-4; Lane 3: U-251 MG; Lane 4: Human Plasma; Lane 5: Liver; Lane 6: TonsilThis validation was performed by Protein Atlas and the presentation of data is for informational purposes only. HEK293T cells were transfected with the pCMV6-ENTRY control (Left lane) or pCMV6-ENTRY WISP2 (RC204636, Right lane) cDNA for 48 hrs and lysed. Equivalent amounts of cell lysates (5 ug per lane) were separated by SDS-PAGE and immunoblotted with anti-WISP2. 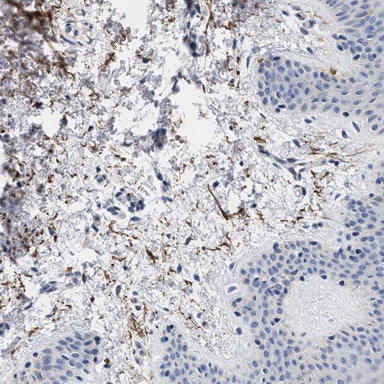 Anti-WISP2 antibody IHC of human testis. Immunohistochemistry of formalin-fixed, paraffin-embedded tissue after heat-induced antigen retrieval. Antibody concentration 10 ug/ml. 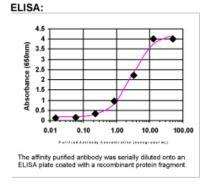 To detect hCTGFL/WISP-2 by direct ELISA (using 100 ul/well antibody solution) a concentration of 0.25-1.0 ug/ml of this antibody is required. This biotinylated polyclonal antibody, in conjunction with compatible secondary reagents, allows the detection of at least 0.2-0.4 ng/well of recombinant hCTGFL/WISP-2. 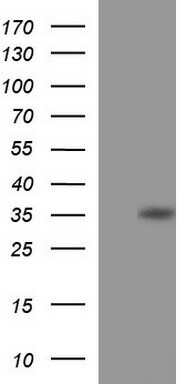 To detect hCTGFL/WISP-2 by sandwich ELISA (using 100 ul/well antibody solution) a concentration of 0.25-1.0 ug/ml of this antibody is required. This biotinylated polyclonal antibody, in conjunction with Polyclonal Anti-Human CTGFL/WISP-2 (TA328286) as a capture antibody, allows the detection of at least 0.2-0.4 ng/well of recombinant hCTGFL/WISP-2. To detect hCTGFL/WISP-2 by sandwich ELISA (using 100 ul/well antibody solution) a concentration of 0.5 - 2.0 ug/ml of this antibody is required. This antigen affinity purified antibody, in conjunction with Biotinylated Anti-Human CTGFL/WISP-2 (TA328285) as a detection antibody, allows the detection of at least 0.2 - 0.4 ng/well of recombinant hCTGFL/WISP-2.